There's a small (SMALL!) walkway next to this staircase that was originally covered with carpet. It's been ripped out and replaced with laminate, but now there's a crevice between the laminate and the wall molding. Any suggestions on how to fix or cover up? Small gaps like that are often filled with white painters caulk. Be sure that it is paintable. Get the small tube (not the caulk gun size). Cut the nozzle size to small. It can be squeezed into the gap and carefully wiped off the laminate with a damp paper towel. Not the answer you're looking for? Browse other questions tagged trim cover or ask your own question. Can I install drywall on the ceiling, without removing crown molding? 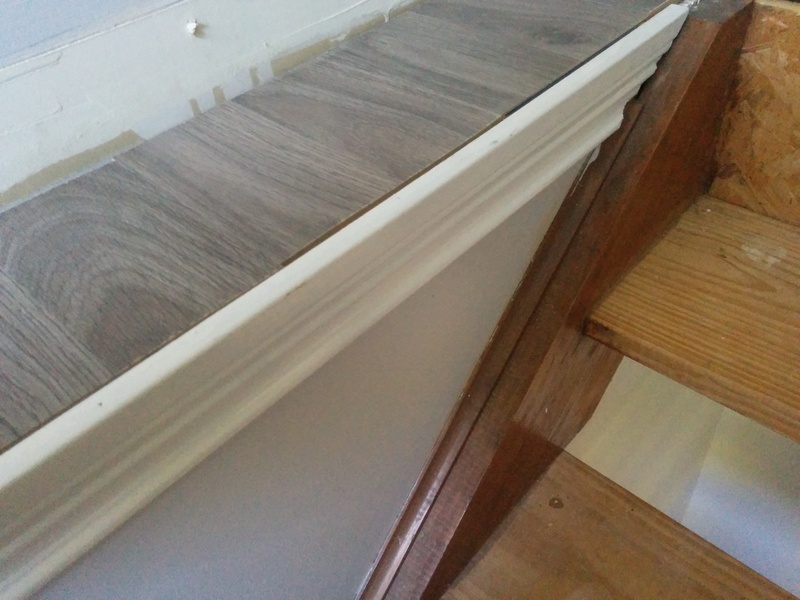 How do I make skirting boards removable? Should I remove baseboards prior to installing laminate or wood floors? Do we need to install shoe molding? How can I lay moulding around this ceiling protrusion? How do I remove this plastic shower drain cover? How can I remove exhaust pipe cover that's sealed with silicone?